media whilst studying, hence, using art as a medium to learn can be considered unconventional at best. 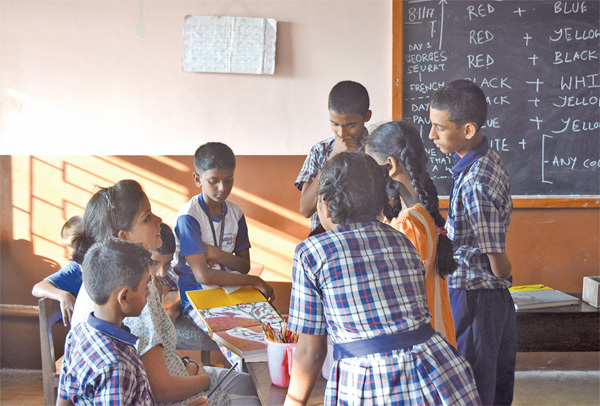 Working towards breaking this stereotype by conducting art workshops with students of different age groups is visual artist and educator Nilanjana Nandy, who has over a decade of experience in teaching and working with students. She recently conducted a workshop, titled ‘Anatomy of a Dot’ for youngsters as part of the initiative taken by Serendipity Arts Trust. Over the course of working with numerous students, she realised that art can help shape people if the subject is introduced at a young age. She explains that art is a very versatile transdisciplinary experience and children are more creative and adaptive than adults, since they are able to grasp more. Therefore, when a child is exposed to art at the age of eight to ten, they become more receptive. Art enables children to build areas of questioning and exploring. “As an individual, when you start questioning and are inquisitive and interested in exploring, you look out for something that is more meaningful in life, says Nilanjana, adding that art helps an individual ask themselves difficult and relevant questions in a more mediated manner. As an art educator, Nilanjana conducted the workshop ‘Anatomy of a Dot’ with students from several age groups. This workshop is based around the quintessential dot, as it is the most basic aspect of anything visual. “The course I have developed with The Foundation for Indian Contemporary Art (FICA) includes ‘Anatomy of a Dot’. “This topic in particular works well with all age groups for the simple reason that the unit – the dot – looks very simple and not at all intimidating,” says Nilanjana. This theme explores how the dot has been explored by artists across centuries, continents and cultures. The dot was adapted to the topic and theme of the workshop, which was ‘My Goa’. At the workshop, these youngsters were encouraged to explore the spaces around them and form their own narratives, and share their visions and expressions of the city. This helped them visualise their relationship with the surroundings and the environment. The workshop was designed based on the belief that education is not only about skill-building but also about the overall development of the child, both in academics and in life. Serendipity Arts Trust (SAT) in collaboration with FICA have come together to spread awareness of art in Goa and make art accessible for people of all age groups. This workshop is a part of that initiative. This year, the Serendipity Arts Festival will be spread over a period of eight days in December in the vibrant settings of Panjim. This edition of Serendipity Arts Festival will feature over 70 art projects, including 40 projects that are commissioned specifically for the festival. These projects will be curated by some of the leading names in their respective fields: Ranjit Hoskote and Riyas Komu will be curating Visual Arts; Manu Chandra and Odette Mascarenhas are theexperts in the field of Culinary Arts; theatre will be curated by Lillete Dubey and Anuradha Kapur, while musicians Shubha Mudgal and Ranjit Barot will be taking over the musical projects. The festival venues range from historic Portuguese structures to modernist marvels and will be dispersed across a mix of indoor and outdoor locations along the waterfront of the capital. The venues include Adil Shah Palace, Captain of Ports Jetty, Bento Miguel, Children’s Park, Old GMC, Kala Academy and DB Ground.